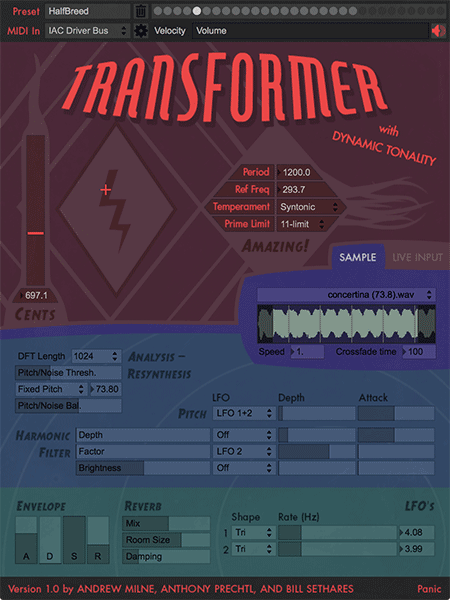 Transformer is a Dynamic Tonality analysis-resynthesis synth. It transforms an audio sample, or live audio, by separating it into pitched components (partials) and noise. The amplitudes and frequencies of the partials, and the balance between noise and pitch can then be dynamically adjusted. As with all Dynamic Tonality synths, it supports a wide range of microtonal tunings and the partials can be retuned to match the underlying tuning, thereby minimizing sensory dissonance. The tunings are produced by a period and a generator (for standard Western tunings, the period is the octave and the generator is the perfect fifth). The sizes of both can be freely adjusted to morph between many diverse tunings. The user interface is divided into five main sections. The grey section at the top has basic settings including MIDI input port selection, presets and their management, main volume, and velocity sensitivity. The maroon section has the standard Dynamic Tonality controls (Tuning Slider, Tone Diamond, Period Control, Temperament Menu, and Prime Limit Menu). These controls are explained in the About section. The violet section is where you can choose whether the audio input is live or a sample. Samples can be chosen from the menu, and your own samples can be added. The display shows the waveform: click to set the sample release point, click-drag to set the sample loop region. The crossfade time over each loop can be adjusted, as can the speed of the sample (this affects just the speed, not the resulting pitch). Cool effects can be created by using live audio input such as singing or talking (it is advisable to use headphones to avoid feedback). The blue-grey section has controls affecting the analysis and resynthesis. It also contains a harmonic filter which adjusts the partials' amplitudes, each of whose controls can be modulated by one or both LFOs. The function of each control is described in a pop-up when the mouse is positioned over it. The turquoise section at the bottom contains familiar synthesizer controls: ADSR, reverb, and LFO waveforms and rates. Transformer is based on TransFormSynth, which is no longer under active development. Transformer is a portable standalone application distributed in a zip file. We uploaded the latest version, 1.0.2, on Jan 10, 2015. Transformer requires a recent version of the Java Runtime Environment (JRE) to be installed. JRE can be downloaded for free from Oracle. Although Transformer is currently available free of charge, we would greatly appreciate a small donation to help us continue to provide updates and develop new software. To send feedback or report a bug, please send us an e-mail: aprechtl [ a t ] gmail [ d o t ] com, or andymilne [ a t ] dynamictonality [ d o t ] com.